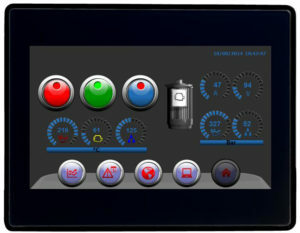 All SMART control panesls have a brillant display with LED background lighting. As the display size, you can select between 4,3″, 7″ and 10,1″. Each device has one 10/100 MBit Ethernet-Port, 1x USB Host (2.0, max. 500mA) and a combined serial interface (RS-232/RS-422/RS-485). On the front side, the devices provide protection class IP66, a plastic housing and a resistive foil touchscreen. 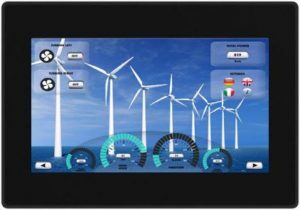 These are ideal products for your cost sensitve projects. The user interface and the functionality behind will be easily developed with our PC-Software jMobile. You can order the development as a service, or you can also develop and program the user interface by your own. In this case, you have to order / buy a license for the software jMobile (not free of charge).